CEBU CITY—The historic 7th Provincial Chapter was concluded in the evening of February 23 with the election of the four Provincial Councilors and the delegate to the 56th General Chapter in 2022. Fray Leander Barrot was elected delegate of the Province to the 2022 General Chapter. Fray René Paglinawan was elected substitute to Fray Barrot. Everybody was awaiting for that conclusion when the Provincial Councilors would have been elected. And it came to pass on February 23, a day earlier than scheduled. Actually, almost all in the Chapter hall expected that the proceedings would end up even much earlier. However, due to the many corrections and integrations when the Directory of the Province was tackled, the closing was delayed. Nevertheless, it was unanimously approved. Barrot received a resounding applause. It was followed by the reading and approval of the minutes of yesterday’s sessions. For the completion of the rest of the minutes, Fray Jose Ernil Almayo, the secretary of the Chapter, was given the vote of confidence to integrate all the suggestions mentioned in the proceedings. Towards the conclusion of the Chapter activities, Fray Miguel Miró gave his message of gratitude and challenge to the newly elected o cials and to all capitulars. 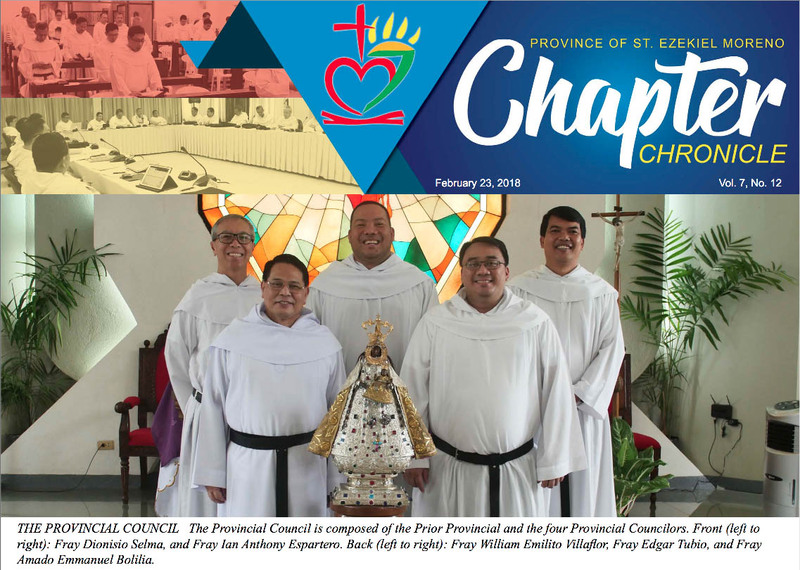 Then, he oficially declared the 7th Provincial Chapter closed at 6:49 PM. The thanksgiving mass that followed was presided by Fray Dionisio Selma together with two re-elected councilors as altar concelebrants. Fray Selma, in his homily, exhorted the religious of the Province to share in the collective responsibility and become themselves bearers of communion and forgiveness. During dinner, it was also known that the Full Council, or the meeting of the Prior General together with the elected Prior Provincial and councilors, will meet the following day, February 24, for the appointment of the Provincial Secretary as well as priors and vice-priors of domus formatae such as the communities of the four big schools, the four seminaries, and the Provincial House.